Quite a number of people could do with some wedding vows examples to help with ideas for their big day. A vow is a promise, and wedding vows are the promises you make to your partner at your wedding. In writing wedding vows, it helps to imagine what you would wish your partner could promise you, write it all down, and edit. Take motivation from the real couples who composed their own sentimental real wedding vows. How do I write my marriage vows? So, never fret, just follow these simple steps. Think about your spouse and all they mean to you. Consider what the marriage will mean to your lives. Write it all down, and edit repeatedly. Take thoughts from these self-composed vows from real couples who made custom ones. I, Bride/Groom, commit myself to you, Bride/Groom, as wife/husband/partner, to learn and grow with, to explore and adventure with, to respect you in everything as an equal partner, in the foreknowledge of joy and pain, strength and weariness, direction and doubt, for all the risings and settings of the sun. We tie these knots to symbolize our connection to one another. They represent our trust in each other and our combined strength together. 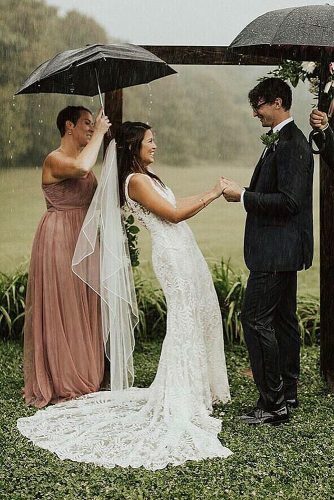 OFFICIANT: Do you, Bride/Groom and Bride/Groom, pledge to create a life of mutual respect, compassion, generosity, and patience toward each other as you grow together in years? OFFICIANT: Do you pledge to recognize each other’s individuality and celebrate each other’s uniqueness as a strength in marriage? While at the same time, will you guard one another’s weaknesses with understanding, support, and inspiration? OFFICIANT: And do you pledge to share the love you have for each other with all living beings? To be a couple that lets their marriage radiate into others, making their lives more beautiful because of it? OFFICIANT: Bride/Groom and Bride/Groom, if you will face each other and repeat after me. Bride/Groom: Bride/Groom, I give you my life. With all that I am and all that I have, I honor you. I, Bride/Groom, take you, Bride/Groom, to be the wife/husband/partner of my days, the companion of my house, the friend of my life. We shall bear together whatever trouble and sorrow life may lay upon us, and we shall share together whatever good and joyful things life may bring us. With these words and all the words of my heart, I marry you and bind my life to yours. and we will share together our store of goodness and plenty and love. Click HERE to download free traditional vows examples! Click HERE to download free personal vows examples! Click HERE to download free vows examples for him! Some wedding vows include not just the couple, but also other members of the family. This usually occurs at second marriage ceremonies and weddings for blended families. So find below some wedding renewal vows examples as well as wedding vows to stepchildren examples for such weddings. 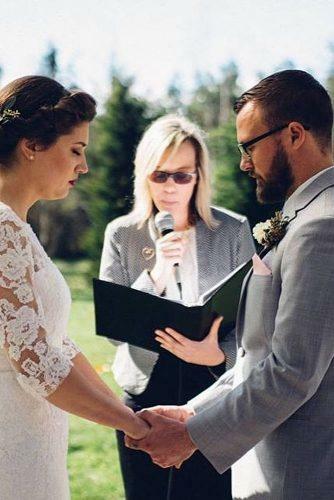 OFFICIANT: These sacred vows are not just between __________ and _________ because you will not only be a new couple, you will be a new family. ___________, will you please join us now for the special family rites of this wedding. Click HERE to download free family vows examples! 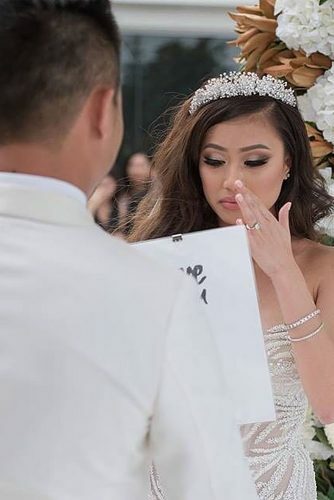 Quite similar to personal wedding vows, these unique wedding vows are different from the norm, and most definitely the couple’s own words. These do not stick to any specific wedding ceremony script, and below are a few examples. Click HERE to download free unique vows examples! Some couples choose to personalize their vows and have fun doing it. This is what produces fun and comical wedding vows. Below are a few such hilarious wedding vows examples. Click HERE to download free funny vows examples! Religious wedding vows are faith-based vows with wordings based on the particular faith of the couple getting married. Each with their different styles of wedding vows. Bride/Groom, take this ring as a sign of my love and fidelity in the name of the Father, and of the Son, and of the Holy Spirit. in the presence of God, I make this vow. and to cherish, until we are parted by death. This is my solemn vow. to love and to cherish, till death us do part, according to God’s holy ordinance; and thereto I plight thee my troth. With this Ring, I thee wed: In the Name of the Father, and of the Son, and of the Holy Ghost. Amen. I, Bride/Groom, take you, Bride/Groom, to be my [wife/husband]. Click HERE to download free Christian sample wedding vows! I take you for the love you hold in your heart, and vow to spend my life cultivating my love and care for you, for our family, and for all living things. Our relationship is my most important consideration; it gives me strength, and I vow to put every effort into strengthening it in turn through honesty, faithfulness, and patience. For all the days that we live with one another, I promise to spend each day working to become a more true version of myself, and I will do my utmost to help you do the same. In this effort, I take the Threefold Refuge vows, the Three Boundless precepts, the Ten Grave Precepts, as well as your wisdom and your council as my guides. I, Bride/Groom take you Bride/Groom to be my husband/wife, my partner in life and my one true love. I will cherish our friendship and love you today, tomorrow, and forever. I Bride/Groom, take thee, Bride/Groom to be my Husband/Wife- To have and to hold, in sickness and in health, for richer or for poorer, in joy and sorrow, and I promise My love to you. And with this ring, I take you as my Husband/Wife, for as long as we both shall live. Do you, Bride/Groom promises to love, cherish and work day and night to bring total happiness to Bride/Groom? 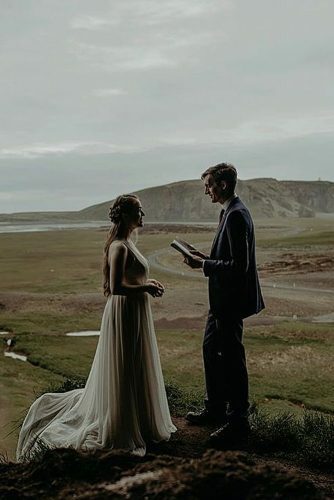 Do you promise to practice generosity, morality, patience, and joy in all you do; mindfulness and wisdom to treat [Bride] and all others with loving kindness and compassion, for all the time you are together, knowing that this marriage can only be as good as the two of you make it. Click HERE to download free Buddhist vows examples! Non-religious wedding vows are vows made by couples to each other, which are not based on any faith or religion. These vows are based simply on the love that they have for each other. I take you to be my spouse. I promise to choose you every day, to love you in word and deed, to do the hard work of making now into always. To laugh with you, cry with you, grow with you, and create with you. To honor the divinity in you, of you, and around you. To be your kin and your partner in all of life’s adventures. Loving what I know of you and trusting what I don’t yet know, I give you my hand. I give you my love. I give you myself. Will you give me yourself? Will you come to travel with me? Today, surrounded by people who love us, I choose you, Bride/Groom, to be my partner. I am proud to be your wife/husband/partner and to join my life with yours. I vow to support you, push you, inspire you, and, above all, love you, for better or worse, in sickness and health, for richer or poorer, as long as we both shall live. OFFICIANT: Do you, Bride/Groom, promise to be a loving friend and partner in marriage, to talk and to listen, to trust and to appreciate, to respect and to cherish Bride/Groom’s uniqueness? Do you promise to support, comfort, and strengthen him/her/them through life’s joys and sorrows? Do you promise to share hopes and dreams as you build your lives together, and to grow with Bride/Groom in mind? Will you strive to build a home that is compassionate to all, full of respect and honor, filled with peace, happiness, and love? Do you promise to always be open and honest with Bride/Groom, and cherish him/her/them for as long as you both shall live? Click HERE to download free non-religious vows examples! Finding the right words to say your wedding vows can be quite challenging and confusing sometimes. So, if possible, use any of the above as a wedding vows template, to help boost your ideas while writing your wedding vows. 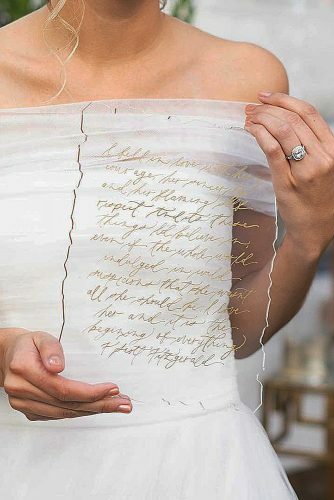 Writing wedding vows can be fun, and can be interesting. You might be inclined to include a list of quotes to use in your wedding vows. Either way, be sure to use the words you believe in and go on to have the wedding of your dreams.